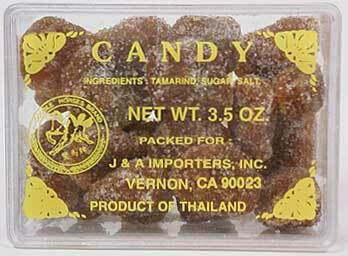 We recommend our new all natural tamarind candy. If you have an acquired taste for tamarind, this is a great snack. It's a sour, pure natural tamarind without any preservatives or artificial ingredients. The tamarind is covered in a mix of sugar, chile, and salt (you commonly find in Thailand the same chile/sugar/salt mix offered with sliced mango). It's delicious eaten as a candy, and it's a key ingredient in this innovative recipe for tamarind sauce. We also have a recipe for tamarind candy. The tamarind sauce that's prepared as part of this recipe is delicious and can be used for all kinds of dishes, we especially like it with our recipe for duck-fried rice. During a visit to Thailand we encountered the most delicous candy we've ever tasted. The candy was all natural, made of just tamarind paste and sugar, shaped like a Tootsie Roll and wrapped in little plastic wrappers twisted at each end. It was soft, fruity, slightly sour, chewy, and the overall flavor of this candy was just perfect. While we've offered tamarind candy of our own, what we tasted was different because it was so fresh. We worked on our own tamarind candy recipe for a few days to get the flavor down but something is not quite right. It's either too sticky & wet, or it becomes overcooked with hard bits developing in the fruit. If anyone reading this can help improve the recipe we'd really appreciate it. Perhaps a candy maker reading our recipe might like to offer some help. Feel free to use the form below to send improvements and suggestions.